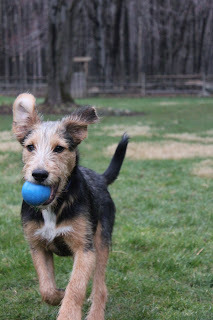 I’m talking about Tucker, the scruffy terrier mix who came to live with us in March 2011. (Feel free to read the story of how he joined us.) When my three dogs are together (which is nearly always), they look like a color-coordinated set. Jasper is tan and silver with touches of black--somewhat like a light German Shepherd, Lilah is obsidian-black, and Tucker is an interesting combination of all of that. Imagine an Airedale Terrier, but shrink him down a bit, and lighten the black saddle. Then mix in some foxhound, particularly on his chest, which features tans and golds and white. Give him the scruffy fur of a terrier, but the build and face of the hound, including a very, very long tail that's black on top, tan on the bottom and has just a hint of white at the very tip, like he must have wagged it into a recently whitewashed fence. Lilah, Tucker and Jasper. You can see the hound markings on Tucker's chest in this picture. "I can quit any time." Tucker relaxes in the cool shade of a rhododendron, with Ball at hand/paw. If he thinks you're not paying enough attention, Tucker will invent his own Game. One of his favorites is Roll the Ball Under the Hot Tub Steps and Try to Get it. This is endlessly amusing (though not as much fun as Chasing), because sometimes the Ball is out of Reach and then you have to Ponder how to get it. Reach a paw between the stairs? Stick your head underneath? You have to be careful because you might knock it the wrong way and make it harder to Get. The learning process went something like this: I put a large pottery bowl next to me outside on the deck. Tucker kept throwing the Ball at me, but I didn't pick it up. After what must have seemed like decades of me Not Throwing the Ball (which was really more like two minutes), he accidentally dropped it into the bowl. I told him "Yes! Good dog!" and I picked it up and threw it. It took him about three tries to realize the Ball will only get thrown if he put it in the bowl. After that, it took him about two more tries to figure out the same rule applies to any container I indicate when he has a Ball. Putting The Ball in the bucket; sometimes you have to stare at it after you put it in to make sure it's been done correctly. Otherwise Someone might not Throw the Ball. Tucker has a very different relationship with Dawn; there's no chasing, hissing or swatting. Here, he is tasting...umm...giving her a kiss while she sits on Aaron's lap. 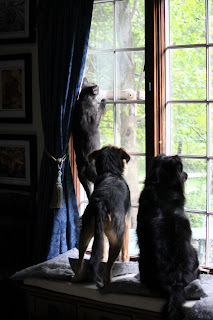 Athena, Tucker and Lilah watchin' birds. All three are sure they could catch one, if they were outside. Tucker has a unique perspective; he's not held back by any preconceived notions of the way Things are Supposed to Be. Tucker believes Deer are Evil and Must Be Barked About, which, at first seems very appropriate for a Dog. Except Tucker will Bark About Deer even if he doesn't see them. Even if he's in the house. Even if it's late at night. He can smell them. They're out there. In the dark. Doing Deer things. Thus you have to Bark About Them. 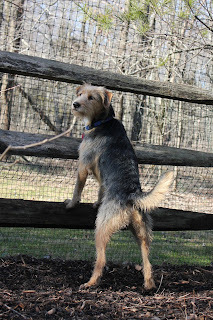 Though it's best to Bark About Deer through the fence. Because then you're Barking At them instead of About them. Which is much more fun. Size doesn't matter to Tucker. I believe he thinks he's much bigger than his 40-something pounds. 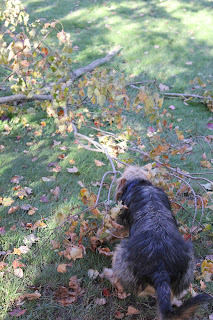 Which is why he'll try to drag an entire tree branch; hey, it's just a Big Stick. Then again, Tucker sometimes finds himself in sticky situations because he's just a little...too big. "Um, a little help here, Mom." A somewhat abashed Tucker, after a walk in which he stuck his head in a bush full of tiny burrs. It took me a half hour to get every one of nature's own teeny velcro balls off his poor little face. Always creative, if Tucker wants something, he'll find a way. Whether it's getting a Ball from under the stairs, or finding drinking water on top of a table after a rain storm, Tucker will figure out how to do it. "Civilized Dogs eat and drink at the table, right?" When I pick Tucker up in the afternoon, he calmly walks out, sits for a treat, waits patiently while I open the door and stays put until I give him the Release command. Other dogs may come and go through the Camp Bow Wow office, leaping and jumping and wagging because they’re so happy their people came. Tucker offers me a subdued wag—until we get home, and the two of us are greeted at the door by Jasper, Lilah, Athena--and sometimes, Dawn. I take my coat off, put my stuff down, take my glasses off (it becomes pretty evident why) and then sit on the floor while I’m covered with doggy kisses. Suddenly, there’s Tucker greeting me like we haven’t just shared a car ride home.